The Information contained herein has been reproduced from the Berea Lodge 100th Anniversary Booklet for your enjoyment & reference. Please, My Brethren, we need to continue this History to include the years from 1968 to the Present. If you have (or know of) any information of historic interest, please send it to me (by email to wb8rni2@aol.com) or to our P.O. Box 15, Berea, OH 44017, [ATTN: WB Hank Hausmann.] We are especially looking for Denison #640, Strongsville #728, & Olmsted Falls #705 Lodge History, and the details of the several mergers into Quarry #382. We present this Centennial book as a history of Berea Lodge No. 382, F . & A. M., based upon the minutes and records of the Lodge. The coverage for the first seventy-five years, of 1867 to 1942, is the work of the Seventy-fifth Anniversary Committee and their writing has been included intact. The members of that Com­mittee were: Almon H. Williams (Chairman), Walter R. Baldwin, Carl J. Eckert, David H. Hopkins, and Elbert C. Platt. Consequently the work of the present Centennial Committee for this history has been devoted to research in the minutes and rec­ords of the Lodge from 1942 to 1967 and the furnishing of photo­graphs for the more recent years. We have most earnestly tried to be accurate in our accounts and if inaccuracies or serious omissions have occurred we beg your indulgence. It is with great humility that we submit this work to the ar­chives of Berea Lodge in the hope that the future will bring even greater accomplishments by the Lodge for later committees to extol. Freemasonry is fraternal in organization, religious in character, based on the belief in the Fatherhood of God and the brotherhood of man. Be prompt to claim that Freemasonry is not a secret society. Freemasonry is a voluntary association wherein the in­terested one comes of his own free will and accord. Discussions on religion and politics have no place in our proceedings. Freemasonry in its every effort and purpose, strives to do charitable work within its membership and for society and, through its teachings, seeks to make good men bet­ter men. Freemasonry is a band of men bound together throughout the world in the bonds of brotherly love and affection. Freemasonry means kindness in the home, honesty in business, courage in society, fairness in work, pity and concern for the unfortunate, resistance toward the wicked, help for the weak, love for one another, and, above all reverence and love for God. On the evening of Wednesday, November 28, 1866, a number of citizens of Berea met in a room adjacent to Mr. Christian Ohle's store room on Front Street for the purpose of organizing to secure a dispensation for a Lodge of Free and Accepted Masons at Berea. Committees were appointed to secure a place for the Lodge to meet, secure funds for furnishing a Lodge Room, and write to the Grand Lodge for the necessary forms for securing the consent of the neighboring Lodges. Another meeting was held on Wednesday evening, December 12, 1866, when the executive committee reported that a lease had been made with Mr. C. Ohle for the upper floor of his store for $100.00 a year. This building was located at the present site of Lane's dry goods store, No. 54 Front Street. It was a two-story wooden building, set back from the street, and was about twenty by thirty-six feet in size. A walk on the south side led to a stairway to the second floor. This building was built in 1840 by the Lyceum Village and used as a store and meeting place. At this meeting on December 12, the forms from the Grand Lodge were on hand and the petition for a dispensation was signed by Frank R. Van Tyne, a Past Master of Wellsville Lodge, No. 180, Wellsville, Ohio, and holding a dimit from that Lodge; S. Y. Wadsworth, holding a dimit from New England Lodge, No.4, Worthington, Ohio; Gershom M. Barber, holding a dimit from Iris Lodge, No. 229, Cleveland, Ohio; Norman D. Meacham, holding a dimit from Medina Lodge, No. 58, Medina, Ohio; D. S. Fracker, holding a dimit from Amity Lodge, No.5, Zanesville, Ohio; W. P. Gardner, holding a dimit from Tiffin Lodge, No. 320, Tiffin, Ohio; Charles Vansise, holding a dimit from Rose Lodge, No. 304, Monroeville, Ohio; and G. B. Sturgis, holding a dimit from Marion Lodge, No. 70, Marion, Ohio. The Committee to secure funds reported that $165.00 had been subscribed by the eight petitioning Master Masons together with four other Master Masons and two Entered Apprentices who had received their E. A. Degrees in Cleveland Lodges. The dispensation was to continue in force until the next Annual Grand Lodge Communication, to be held at Cincinnati, Ohio, on October 15, 1867. Fees for the degrees were: E. A., $15.00; F. C. $10.00; M. M., $5.00. Membership by affiliation, $5.00. Annual Dues, $3.00 payable in arrears. Stated communications were held on the second and fourth Wednesdays of each month. The Lodge held meetings through the summer months and by October 9, 1867 had raised eight Master Masons as follows: David R. Watson, A. G. Taylor, Charles L. Underhill, Edward J. Kennedy, John Lay, Edward Christian, Benjamin F. Campbell, and William Barker. These, with the eight Master Masons who signed the petition for a dispensation were the Charter Members of the Lodge. The furniture and furnishings of the Lodge were of the simplest form, ordinary wooden chairs, coal oil lamps and candles furnished the illumination and there was a wood burning stove in the Lodge Room only. There was no carpet on the floor until September, 1870, when one was purchased in part with money subscribed by the members. To heat the ante rooms, a stove was purchased in November, 1869. On Friday, November 8, 1867, at 6:00 o'clock P.M., a meeting of Berea Lodge, F. & A. M., U. D., was called for the purpose of being constituted a regular Lodge under the Charter granted by the Grand Lodge of Ohio at their Communication held in Cincinnati on October 15, 16, and 17,1867. Bro. George H. Adams, W. M., of Cleveland City Lodge, No. 15, as the duly authorized proxy of the Deputy Grand Master, performed the ceremonies of Constituting and Installing, and the new Lodge, under the title and rank of Berea Lodge, No. 382, was duly and regularly constituted. At the Stated Communication held on December 25, 1867, a vote of thanks was extended to Mr. S. S. Brown, a jeweler of Berea, for a gift of a copy of the Holy Bible. The minutes do not show that Mr. Brown ever petitioned the Lodge for membership by initiation. On June 9, 1869, the Lodge voted to return to the Brothers the various sums advanced by them at the time of organization. On September 8, 1869, the Committee on Jewels was instructed to purchase a set of solid silver officers' jewels at a cost of $75.00. On February 8, 1871, a committee was appointed to meet with a committee from the local Independent Order of Odd Fellows Lodge in regard to the joint occupancy of a new hall. The minutes do not show a report by this committee. They no doubt ascertained that joint occupancy with other than Masonic bodies was not permitted and the matter was dropped. On September 15, 1871, the Trustees, together with the Past Masters, were appointed a committee to lease the north room on the third floor of the new brick block then under construction, for a term of five years, at $150.00 a year. On January 10, 1872, the Lodge held its first meeting in the new rooms. The Lodge Room was the same as at present except that the platform at the Senior Warden's station extended into the room, and the three steps and platform at the east were nearly as wide as the room. The room was lighted by coal oil lamps on four ornate chandeliers arranged in pairs on steel cables so that when one was raised the other was lowered for cleaning and refilling the lamps. The carpet used in the other Lodge Room, augmented by new carpet of the same pattern covered the floor. This carpet was in use until the present carpet was purchased in 1922. A part of the original carpet is still in use on the floor of our wardrobe room. On April 24, 1872, a motion prevailed that we grant the use of our Lodge and ante rooms to Rocky River Lodge, I. O. O. F., for their coming anniversary. On June 12, 1872, a motion prevailed that a committee of one be appointed to circulate a subscription to replenish the Lodge Treasury. Bro. John C. Nokes was appointed and on January 8, 1873, Bro. Nokes reported that he had collected and paid to the Treasurer the sum of $37.00 and the committee was discharged. from Berea Chapter, R. A. M., for one quarter year rent, but in previous minutes no mention is made of the use of the rooms by the Chapter. On June 25, 1873, Bro. Walter M. Loomis (not a member of Berea Lodge) was paid $4.00 for tyling the Lodge, pro tem. Bro. Loomis was also janitor of the Lodge Rooms. On April 8, 1874, a petition was read asking for consent and recommendation to establish a Lodge at Olmsted Falls, Ohio. It was signed by ten members of Berea Lodge, all residents of Olmsted Township except Wor. Bro. S. Y. Wadsworth, a Past Master of Berea Lodge, who was to be Master of the Lodge under dispensation. Unanimous consent of the Lodge was granted. On April 22, 1874, a petition was presented asking for consent and recommendation and addressed to the M. W. Grand Master praying for a dispensation to establish a Lodge at Dover Township, Ohio. The petition was signed by eleven Master Masons but only four were members of Berea Lodge, viz: Brothers D. R. Watson, J. L. Hand, L. M. Coe, and Saxton Barry. The Lodge certified that Wore Bro. D. R. Watson was a regularly elected and installed Master of Berea Lodge. Evidently the petition for a Lodge at Olmsted Falls was not presented to the Grand Master, or they did not obtain the consent of the neighboring Lodges, for no dispensation was granted them, but a dispensation was granted to the Dover Lodge, which became No. 489 on the granting of a charter on October 21, 1874. On June 10, 1874, in response to an appeal by the M. W. Grand Master of Ohio, $25.00 was voted for relief of our suffering Brethren in Louisiana. On May 26, 1875, a communication was read from M. W. Grand Master A. H. Battin, granting Berea Lodge permission to join in a parade on Saturday, May 29, for the ceremony of decorating the graves of the Union soldiers. On December 8, 1875, the Lodge voted to subscribe $20.00 towards building the Washington National Monument, and at this meeting they also by motion voted to allow the Ladies' Aid Society of the Congregational Church the use of the ante rooms for dressing rooms, on the occasion of their entertainment in Brick Hall, to be given on December 9. On April 26, 1876, by motion, the use of the Lodge Rooms was tendered to the Citizens' Committee for the celebration of the opening of the street railroad, to be held on May 3, 1876. The first reference to the visit of a District Lecturer in the minutes was made in the minutes of a special meeting on April 27, 1891, when Bro. J. C. Crawford, as District Lecturer, was present. In October, 1877, the By-Laws were amended to make the annual dues $2.00 instead of $3.00, but in December, 1897, they were increased to $3.00. On February 13, 1878, Bros. C. W. D. Miller and R. Wellington were appointed a committee to settle with the members in arrears for dues and if necessary take their notes with good security. On August 14, 1878, a motion was carried that no more rent be paid until the roof and ceiling be repaired to the satisfaction of the Lodge. On October 9, 1878, it was resolved by ballot that hereafter no Mason on dimit be allowed to visit this Lodge. On December 22, 1880, a Lodge of M. M. was opened and then proceeded downstairs to Brick Hall (on the second floor), the use of the hall having been tendered by Bros. Sidney Lawrence and W. W. Noble, where the officers for ensuing year were installed in the presence of Brethren and their families and a large number of invited guests. The bill of A. R. Hurlburt, proprietor of the Nichols House, for suppers and hotel expenses was $70.50 (no doubt 50 cents per plate). On November 9, 1881, members of Meridian Sun Lodge, No. 266, of West Richfield and Dover Lodge, No. 489, of Dover Center were present on invitation of Berea Lodge. A supper was served at the Nichols House (then conducted by Wm. Brown), after which they repaired to the Lodge Rooms and Meridian Sun Lodge conducted the work in the M. M. Degree. On April 22, 1885, the present upholstered chairs for the Master and Wardens were purchased at a cost of $94.72. The other two upholstered chairs in the East are no doubt the property of Berea Chapter, R. A. M., No. 134. On March 10, 1886, a committee was appointed to confer with owners of the Brick Block and endeavor to have the weekly meeting nights of the local company of Ohio National Guards changed to some night of the week other than Wednesday. The Company met and drilled in the room now used as our dining room. The local I. O. O. F. Lodge later used those rooms, which accounts for the wickers in the doors. An organ was purchased on May 23, 1888, for $50.75, and on November 28, 1888, Berea Chapter, No. 134, R. A. M. paid Berea Lodge $18.50 for a one-third interest in the same. In July, 1895, the coal oil lamps in the Lodge and ante rooms were replaced with electric lights. On December 27,1905, the regular meeting nights were changed to the second and fourth Fridays of each month, instead of the second and fourth Wednesdays, as they had been since the Lodge was organized. This was done to accommodate the traveling salesmen members who were home only on weekends. In January, 1909, the Lodge rented the south third of the third floor and used it for a dining room, kitchen and property room. On August 25, 1911, the Lodge by motion voted to join with Berea Chapter, R. A. M in a picnic, each to bear one-half of the expense. The picnic was held on a week day at Chippewa Lake and transportation was by chartered cars on the C. & S. W. interurban electric railway. This was the first picnic participated in by the Lodge. On April 11, 1913, four Standard Monitors were ordered to be purchased. Previous to this time the monitorial work was printed only in the code. In December, 1914 the coal stoves which had been preceded by wood burning stoves were discarded and gas stoves installed. On December 22, 1916, the Lodge gave consent for a new Lodge to meet at West Park, Ohio, and Wor. Bro. C. G. Warden, a Past Master of Berea Lodge, was designated Master under dispensation. When the Charter was granted on October 17, 1917, it automatically dimitted eighteen members of our Lodge who had signed the petition for a dispensation. The West Park Lodge was named North Star and was numbered 638. On Thursday evening, November 8, 1917, the Lodge celebrated its 50th Anniversary with a banquet, music, speeches, and the showing of lantern slides. An interesting and historical sketch was given by Brother D. T. Gould, covering the first fifty years of Berea Lodge. At this time seventeen members of the Lodge were in the Army or Navy of the United States. On July 12, 1918, an amendment to the By-Laws was adopted which raised the fees for degrees to $40.00, annual dues to $4.00, and fee for affiliation to $4.00. In March, 1919, a group of Lodge members organized a Masonic Club and rented the south second floor room of the building. The By- Laws of the Club provided that to become and remain a member they must be in good standing in some Lodge of F. & A. M. The Club members paid in about $1800.00 and contracted debts of about $900.00 and on January 23, 1920, the Lodge accepted the property and debt of the Masonic Club and the rooms were made available to all members of the Lodge. On February 13, 1920, an amendment to the By-Laws was adopted making the fees for the degrees $60.00 and the annual dues $5.00. On November 12, 1920, a motion prevailed to subscribe $1000.00 to the Berea Community Hospital Fund to dedicate a Dr. H. B. Kirkland memorial ward. There was spent in the years 1921 and 1922 a total of $1940.56 in Lodge improvements. On April 24, 1925, fees for the degrees were raised to $75.00 and affiliation to $5.00 by regular adopted amendment to the By-Laws. On June 12, 1925, our present quarters were dedicated to Masonry in an impressive ceremony. Wor. Bro. W. F. Monell having a proxy as Most Worshipful Grand Master for that purpose. On February 10, 1928, a dinner was served and a meeting held to honor our Lodge Brother Dr. E. S. Loomis, on the publication of his book, "The Pythagorean Proposition." The publication of the same was financed by the Masters and Wardens Association of the 22nd Masonic District. The Masters and Wardens of all the Lodges in the 22nd District were invited and most of them were in attendance. On June 8, 1928, by a vote of the Lodge, the officers selected for a new Lodge at Olmsted Falls were recommended as competent and consent was given for the dispensation asked for, and when the Charter for Olmsted Falls Lodge, No. 705 was granted on October 16,1930, our Lodge automatically dimitted the eleven members who had signed the petition for a dispensation. In the summer of 1928 a fire which originated in the K. of P. rooms at the bottom of the second floor stairway partially destroyed the stairway and damaged carpets, linoleum, and robes, wall paper, etc., of the Lodge to the amount of $390.00, which sum was paid by the insurance company. The building owners rebuilt the stairway and improved it by making the angle less steep than the original. On March 24,1931, a meeting of representatives of Berea Lodge, No. 382, F. & A. M.; Berea Chapter, No. 134, R. A. M., and White Rose Chapter, No. 176, O. E. S. was held for the purpose of forming a Berea Fraternal Benefit Association. At a subsequent meeting, officers were elected and By-Laws adopted. 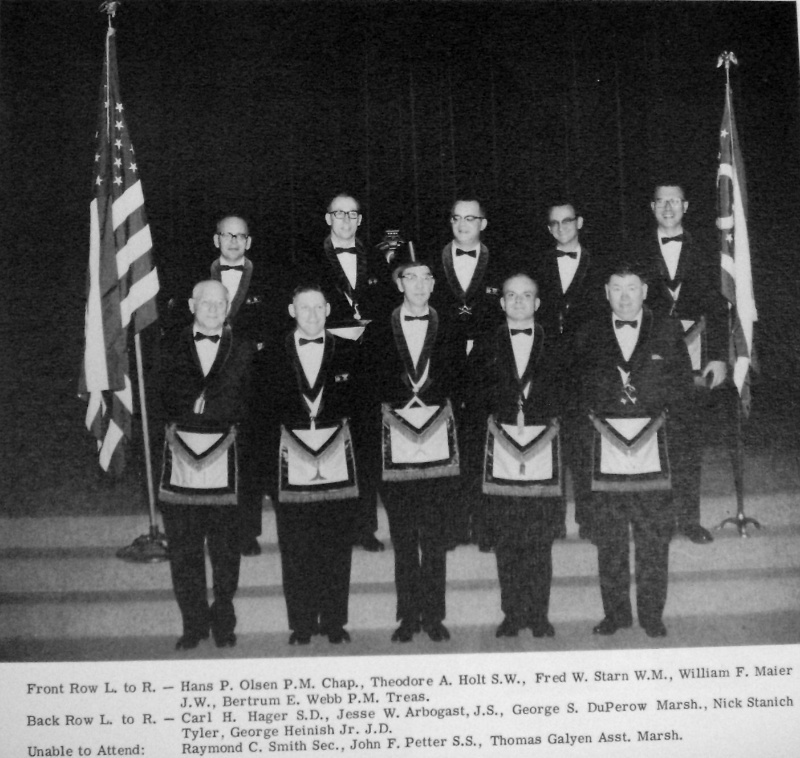 Only members in good standing in the above organizations were eligible to membership but, on May 3, 1933, the By-Laws were amended to include the members of Olmsted Falls Lodge, No. 705, F. & A. M. In the eleven years of operation the Association has paid to beneficiaries the sum of $702.00. On February 13, 1931, the Lodge adopted the practice of presenting each newly made Master Mason with his personal Bible. On October 26, 1934, an amendment to the By-Laws was adopted reducing the fees for the degrees from $75.00 to $42.00. In the wars in which our country has been engaged the members of our Lodge have done their full share. Twenty-two who served on the side of the Union in the Civil War became members of the Lodge. Three who served in the United States forces in the Spanish-American war of 1898 became members. 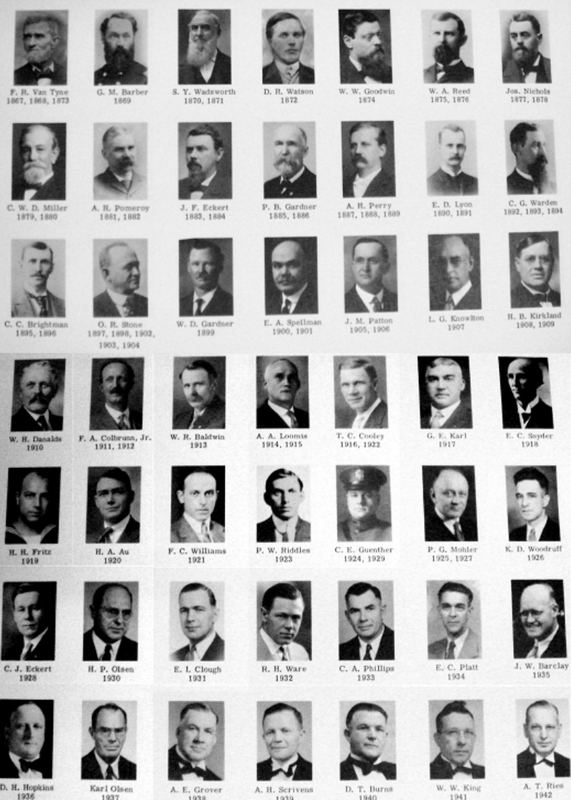 On August 31, 1918, twenty-eight members of our Lodge were in the armed forces of the United States and after World War I was over, twenty-three others who served in that war became members of our Lodge. In the present war we now have eight of our members, and before the war is won will, no doubt, have many more, as in our membership we have thirty-three between the ages of 21 and 35; sixty-eight from 35 to 45, one hundred eighteen from 45 to 65, and twenty-four over 65 years of age, and these oldsters are the only ones now exempt from service in the armed forces or employment in essential war work. have been honored by receiving the 50 year veterans medal awarded by the Grand Lodge of Ohio. Brother Gould, who is 95 years of age, is our oldest living member and is expected to be present on this occasion. Our Lodge also had another veteran member, Brother Edward J. Kennedy, who died before the Grand Lodge honors were awarded. He was a continuous member for 57 years. Our Lodge membership was only eight in 1867 and had increased to seventy-five in 1874, when it gradually fell off to fifty-six in 1897, increased to a high of two hundred seventy-three in 1930, decreased to one hundred eighty-seven in 1934, and is now two hundred forty-three. On only one occasion has our Lodge been honored by presence of a Grand Master and that was on December 22, 1869, when M. W. Grand Master A. H. Newcomb was received in due form. Other Past Grand Masters have visited our Lodge as follows: On September 9, 1881, Past Grand Master Charles A. Woodward was present and conducted the funeral services for Wore Bro. S. Y. Wadsworth, a Past Master of our Lodge. On March 22, 1935, Past Grand Master James B. Ruhl accompanied the District Lecturer on his official visit, and on November 26, 1937, Past Grand Master J. Phillip Perry was present and installed the officers of the Lodge. On September 27, 1940, a resolution was adopted to amend the By-Laws making the annual dues $6.00 instead of $5.00, and on November 8, 1940, the By-Laws were amended by resolution increasing the fee for affiliation from $5.00 to $6.00. On October 10, 1941, a resolution was adopted to create a Temple Fund by setting aside certain monies now in a frozen bank account and adding thereto $25.00 of the fees from each and every candidate raised each year, and 50 percent of each year’s surplus. The said funds are to be used for no other purpose, except in an emergency and then only by a three-fourths vote of the members voting. On February 27, 1942, a motion prevailed that the Temple Committee be authorized to purchase a building lot located at 291 Front Street, from the estate of our late Brother C. F. Lane. 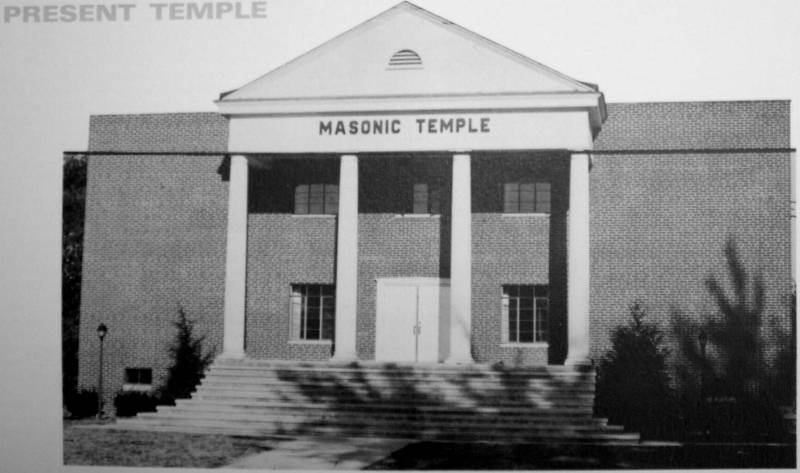 On March 27, 1942, the Shrine Past Masters and Fellowcraft Club of Al Koran Temple were in attendance and exemplified the Master Mason degree on one candidate. In the seventy-five years of its existence, Berea Lodge has raised 530 to the sublime degree of Master Mason. The largest number in any one year being for the fiscal year ending July 31, 1920, when twenty-seven were raised. There were six different years, all before 1893, in which no candidates were raised. "Whereas, our Nation is at war, be it resolved: That, this Lodge hereby registers its approval and support of the Nation's declaration, and pledges unswerving loyalty to the United States of America and her Allies. The Lodge remembered the brethren serving in the armed forces in various ways, including the creation of a military service fund to send Christmas gifts to members of Berea Lodge and their sons, the writing of many letters, and the remittance of the dues of servicemen who were members of the Lodge (resolved December 10, 1943). In addition, Series F $1,000 War Bonds were purchased at various times during the war. 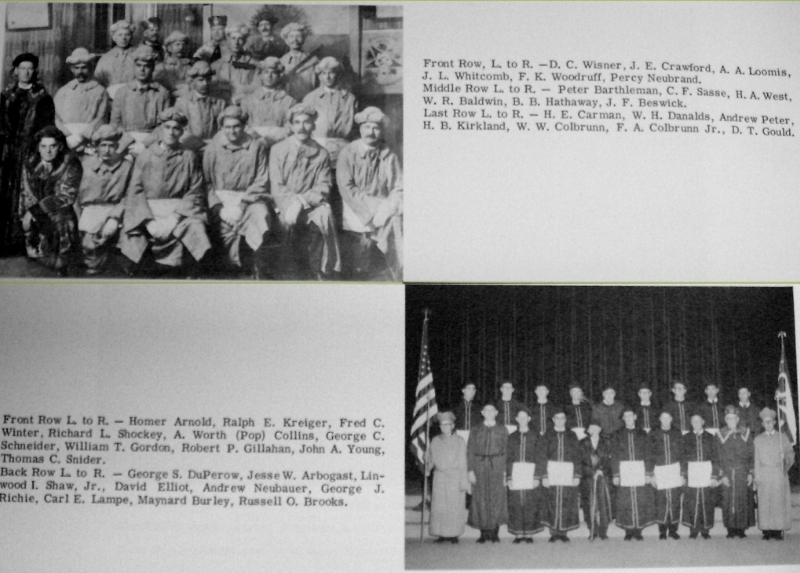 It should also be noted that in October, 1943 Berea Lodge opened its Club Rooms to servicemen in the V-12 Program at Baldwin-Wallace College in order to furnish recreational facilities for these young men. Whereas it appears to be desirable that Berea Lodge #382 endeavor to secure a new temple, or lease a new lodge room for the use of said lodge, and for the use of Berea Chapter #134 and White Rose Chapter #176, O.E.S. Therefore, be it resolved that Berea Lodge #382 adopt the following, which shall authorize those hereinafter specified to incorporate a corporation, not for profit, under the laws and statutes of Ohio, said corporation to be known as Berea Masonic Temple Corporation, and to have an authorized capital stock of $35,000.00 It shall be governed by a Board of Trustees numbering nine, including the Worshipful Master, High Priest, and Worthy Matron of the Berea Masonic orders." D. T. Burns and J. S. Simpson, to serve for a one year term. 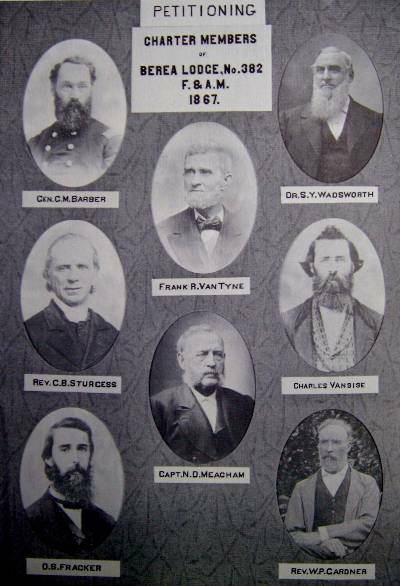 In addition to these six, the Worshipful Master (A. H. Williams), the High Priest (A. T. Ries), and the Worthy Matron (Mrs. L. H. Maechtel), completed the membership of the Board. Upon the resignation of L. A. Fowles, D. H. Hopkins was elected in his place. Between 1942 and 1944 the feeling developed that the recently purchased lot at 291 Front Street be sold and a resolution to that effect was passed on June 25, 1944. On September 22, 1944 the Secretary announced that the lot had been sold. A new location for a future temple now had to be found. As World War II came to a close Brother Arthur Gohlke was appointed to represent Berea Lodge at a Chamber of Commerce meeting to discuss a city memorial for World War II veterans. The months immediately after the end of the conflict found much activity in the Lodge. The Eastern Stars were asked to make 100 new white aprons and 36 pairs of gloves, and it was recommended that the custodian repair broken window latches in the Lodge room. The Lodge continued to buy Series F Savings Bonds of $1000 denomination in order to furnish income for a future Temple. The Lodge year 1946-1947 saw new memberships increase, with 46 members initiated and 37 raised. Minutes for April 25, 1947 indicate that Wor. Bro. Clough recommended that the Charter and Holy Bible of the Lodge be kept in a fireproof safe. Pending adoption of that safety measure the Charter was placed in the safe deposit box of the Secretary at the Bank of Berea. November 8, 1947 was another milestone in that Berea Lodge attended the first Inspection of the Berea Assembly Order of Rainbow Girls. At this same time (November 14, 1947) the records show that Berea Lodge was paying the following rental costs: Lodge Room ...$600 per year; Club Rooms ...$360 per year. The year 1948 saw two more $1000 bonds purchased, one for the Lodge, the other for the Temple Company. On September 24, 1948 the total fees to be collected was raised from $75.00 to $86.00, and new membership showed strong gains. The Recapitulation Report for 1948 showed 55 members raised, and the year 1949 had 43 raised. The year 1949 also included the bestowing of Honorary Membership in Berea Lodge for Most Worshipful Brother Alpheus A. Stephens and Deputy Grand Master William R. Pringle. "Corner stakes showed the lot size to be 140 feet wide and 301 feet deep. ..."The drawings call for a brick veneer construction with a goodly portion of the front of sandstone, with four large pillars at the entrance. The Lodge Room proper is to be 45 feet wide and 63 feet deep with a balcony, a full basement. ...The way building costs are today we all know they are not any better than they were a few years ago, nor does it look to be a let up for the future. This is going to cost us all sacrifices in order that this Temple might come to a reality in the very near future." By February, 1952 it was reported that Worshipful Brother Hans Olsen had accepted appointment as chairman of the Building Committee and Brother Bert Webb the appointment as chairman of the Finance Committee, and by May, 1952 brochures describing the Temple Company and its objectives were mailed to all members of the Lodge. Brother Howard Gaub donated his services as printer. ("Compass" for September, 1952) "Many thanks to Bro. Ray Saylor and his wife, Lila, for the splendid corn roast and eat-together he held for the Temple Co. committees and members of Berea Lodge. Orchids to Bro. Saylor for the fine spirit, it gives us a lot of inspiration and enthusiasm for the new temple." By the Fall of 1952 the lot had been cleared of trees and weeds, and the stumps were ready to be moved. Contributions for the Temple were coming in at an "average" rate, and $10,000 more was needed in order to break ground. During these busy months of the early 1950's there were other noteworthy items not connected with the building of the Temple. On October 13, 1950 it was moved and seconded that there be 11 new Officers' aprons and jewels purchased. 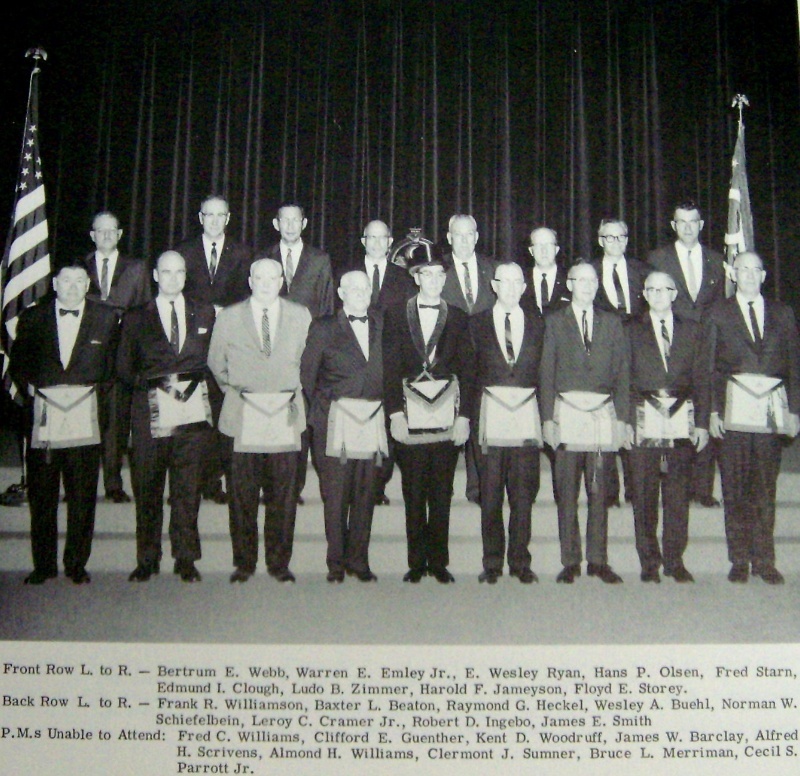 On March 10, 1950 it was announced that Berea Lodge would confer the Master Mason Degree for Strongsville Lodge, U.D. on their first candidate (to be conducted on March 15, 1950). The next year, on May 11, 1951 a petition for dispensation to form a new Lodge known as Maple Heights Lodge, U.D. was granted unanimously, with 31 voting. A charter for this Lodge was granted on October 18, 1951. At the same time (October 4, 1951) a resolution was passed to raise the fees for degrees to $110.00 and the fee for affiliation to $10.00. 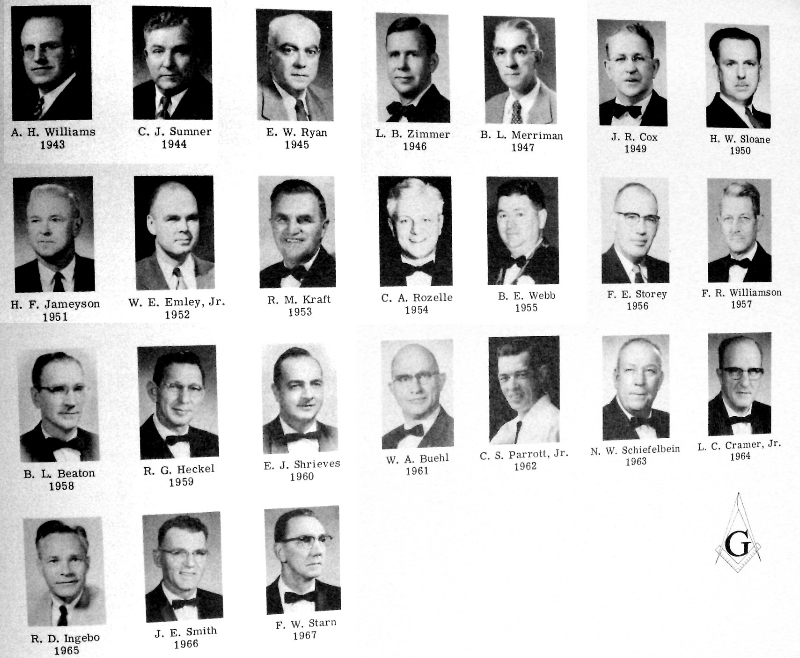 By the close of 1952 a resolution was also passed which would remit the dues of Berea's 50-year members. 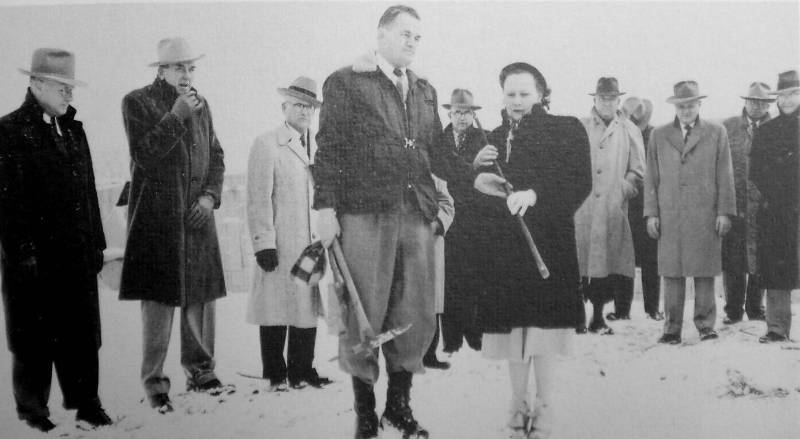 As the Lodge entered 1953 the January issue of the "Compass" reported the good news that sewer and water lines were in, and plans were being projected to begin the new Temple no later than March of 1953. Furthermore, some $2000 worth of cement block were on the lot and it was stressed that orders for steel be placed in order to be ready for delivery in May. The cash on hand necessary to start construction was deemed to be $35,000 and that figure had not yet been reached. On January 2, 1953 an agreement was signed and mailed to the successful bidder for all the structural steel fabricated and erected for the Temple (nearly $26,000). 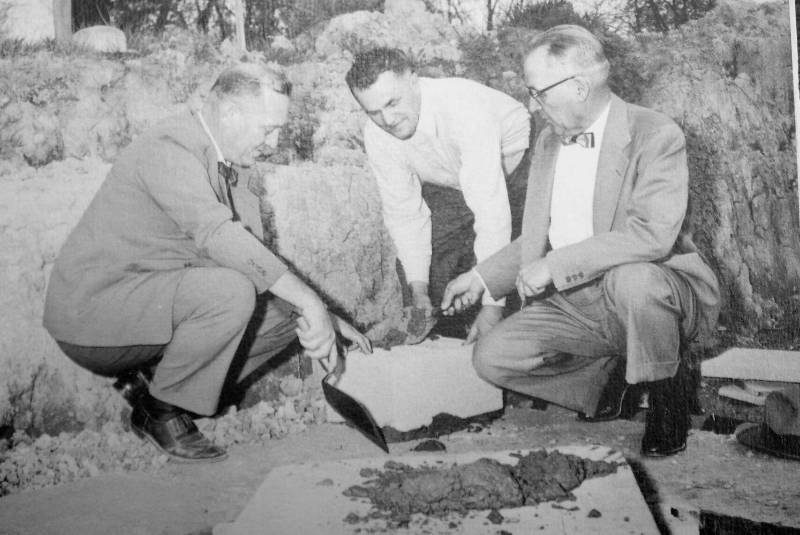 On March 25, 1953, excavation for the new Temple began. Practically all the inside work was planned to be done by the brethren themselves, in order to keep the costs down. The above mentioned effort was supplemented by the ladies of the Eastern Star who collected sales tax stamps for redemption, the cash going toward the construction of the Temple. Moreover, the ladies took over the responsibility of operating the refresh­ment stand and check room at the Saturday night dances held in the agricultural building at the Berea Fair Grounds to gain additional funds. “…The day started with a very gloomy look. We rushed desperately that morning to find all the canvas we could get our hands on to be spread upon the ground for people to walk on should it rain. However, about one o'clock the sun shone through the clouds and guaranteed everyone per­fect weather for the afternoon. The crowd started to gather early in the afternoon. Lodge was declared open by our Most Worshipful Grand Master, Thomas A. Reber, at our old Temple. Immediately thereafter we assembled out into the street and marched to our new Temple for the cere­monies of laying the cornerstone. The Al Sirat Grotto of Cleveland led the parade as color bearers, followed by Knights Templar color guard and a wonderful group of Sir Knights. The EL Ray Grotto band of Elyria followed, led by two majorettes .... Berea Shrine Club Master Masons, Past Masters and present Masters followed. "Struttin" Tom Koncar, acting in the capacity of the Grand Tyler, certainly picked 'em up and laid them down with dignity as he led the various officers of the Grand Lodge in the parade. We all arrived at the new Temple about 3:15 P.M. 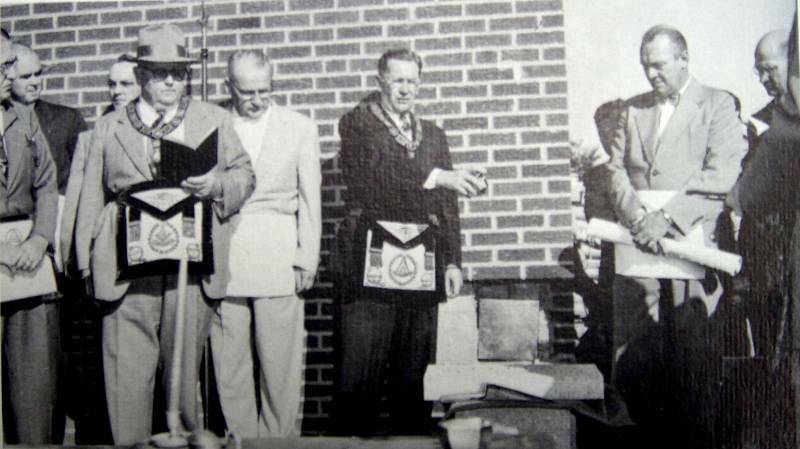 The Most Worshipful Grand Master immediately proceeded in the laying of the cornerstone. The ceremony was impressive, precise and very well performed." According to an article in the Cleveland Plain Dealer, the next day, there were some 700 persons in attendance for the ceremony. As a point of interest it should be mentioned that the trowel used by the Worshipful Grand Master for the laying of the cornerstone is now on display in the Lodge showcase. As the year 1953 drew to a close the Temple roof was com­pleted, the basement ramp and the first floor were covered with concrete, the rough plumbing was in the basement and the two fur­naces to heat the basement were in place. Money matters were a concern at the time, for in December, 1953 it was reported that the Lodge had outstanding bills amounting to twenty thousand dollars. “ … The amount of money spent by the Temple Co. up to December 31, 1953, was $71,112.46. It is estimated another $25,000.00 is needed to complete construction .... "
Indebtedness certificates were issued, totaling $3,575.00 in the year. In addition, money was obtained through the "Annual Ladies Night" consisting of a dinner and entertainment. This source of income netted $900.00 for the Temple fund. At the meeting of February 26, 1954 a number of donations of $25.00 each were made by the brethren to furnish the dining room of the new Temple with tables, which cost $25.00 per table. And of course periodic appeals were made for help in the labor on the new Temple. By the 28th of May, 1954 it was announced that plans called for moving into the new Temple by the end of June. The meeting of June 25, 1954 was the last meeting held in the old Temple, and some of the business transacted included the sale of the carpet and two stoves to one of the brethren. In addition, it was agreed to donate 100 folding chairs in that Lodge room to the Temple Company for use in the new Lodge. Finally, it was announced that all movable property of the Lodge would be moved to the new Temple during the coming week. 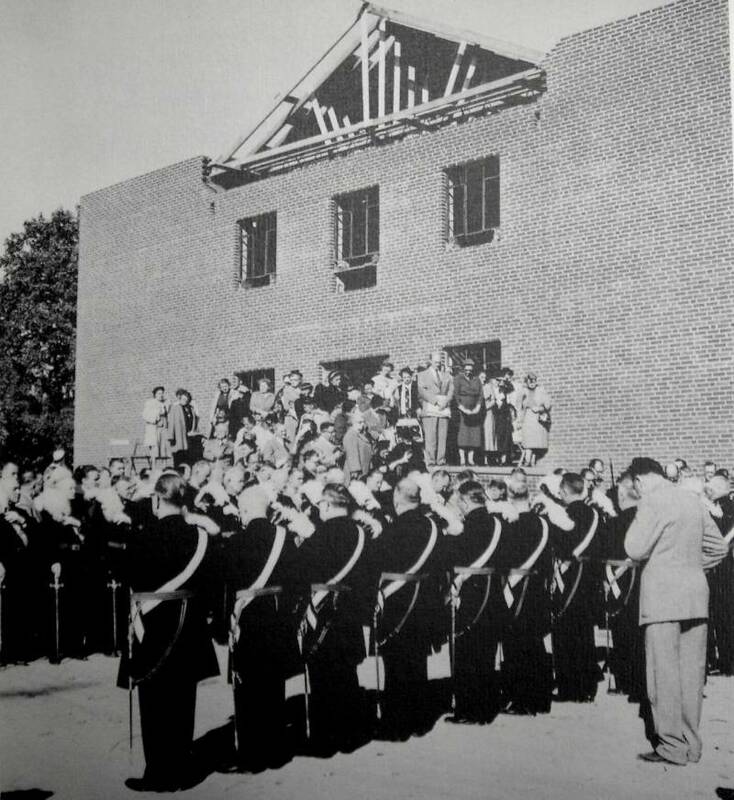 The meeting of Berea Lodge held on September 10, 1954 was a most memorable one, for on that evening the first Lodge opened in the new Temple. The meeting was opened by Wor. Bro. Robert M. Kraft, who had honor extended to him for his untiring efforts in the construction of the Temple. A dispensation from the Grand Lodge, signed by Most Worshipful John L. Guss, Grand Master, was read. This dispensation was to permit the holding of meetings in the new Temple until October 15, 1954. On November 12, 1954 a dispensa­tion from Grand Master Ed. W. Kuns was read, permitting the Lodge to hold meetings until the Temple was dedicated. It was also in 1954 that a Council of Royal and Select Masters, to be known as Triangle Council, U. D. was formed and petitioners were sought. 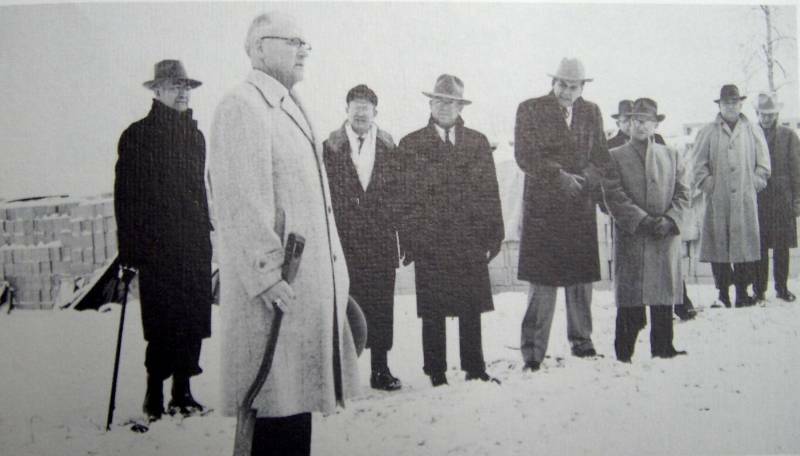 The first Installation of Officers in the new Temple occurred on December 10, 1954 with Wor. Bro. Bertrum E. Webb as Wor­shipful Master. One hundred and ninety brethren were present for this historic occasion. Just five days later another first in the new Temple was the raising of the first member to the Sublime Degree of Master Mason. The candidate was Bro. William M. Williams, raised by Wor. Bro. Robert M. Kraft. To round out a busy month, the first Christmas Party in the new Temple was held in the dining room. The New Year of 1955 began with a "Victory Dinner" held on January 22 and the event was a huge success. A total of $2,500.00 was raised from the dinner plus donations made at the time. Another very fine donation during this month was a 51 volume set of The Ohio Archaeological and Historical Society to be used in the new Lodge Library. Carpeting for the Lodge room was a major consideration in early 1955, and the cost was estimated to be $3,600.00. By March, 1955 the carpeting was ordered. "Prior to opening of Lodge, Holy Grail Commandery, NO.70 Knights Templar posted colors. There were more than 100 brethren present at the afternoon program over which Most Worshipful Brother William R. Pringle presided. The din­ner was attended by nearly 300 Masons and their ladies, with Mayor and Mrs. Manning as our guests. Mayor Man­ning extended official greetings to all. The evening pro­gram was highlighted by groups of vocal, violin and organ numbers and a very inspiring address by M. W. Bro. Pringle. Other Past Grand Masters in attendance for the dedication ceremony were Most Worshipful Brothers James J. Harbage and Carl Ellenwood. It was also in 1955 that Berea Lodge received a new Hammond organ, which was donated by Mr. and Mrs. George E. Beach as a memorial to their son John. This wonderful contribution to the Temple was delivered May 26, 1955. Further donations to the Lodge came in 1957 as altar and ped­estal cloths were given by a brother, and later in the same year gavels were presented and the chairs in the East, West and South were refinished and donated by two brethren. The inflationary trend of the 1950's was reflected in the raising of Lodge dues in September, 1957. At that time the annual dues were increased from $10.00 to $12.00, and the fees for affiliation were raised from $10.00 to $25.00. Both of the above increases were to become effective at the November annual meeting in 1957. As the Lodge entered the year 1958, Wor. Bros. Floyd Storey and Frank Williamson, Bros. Raymond Heckel and Norman Schiefel­bein, and Worshipful Master Baxter Beaton traveled to New London, Ohio to purchase a complete set of Fellowcraft robes. The set, costing $450.00, was paid for by the Hiram Club whose funds came exclusively from their Annual Ladies' Night Steak Dinner. In Sep­tember of 1958 the following resolutions were passed: (1) that the Lodge pay the expenses of the Junior Warden and Senior Warden to Grand Lodge, (2) that Lodge pay the Secretary's expense to the Secretaries' Association meeting each year, (3) that Berea Lodge, hold an Annual Picnic and Annual Christmas Party with Berea Chapter #134, Triangle Council #139 and White Rose Chapter #176, O.E.S. and these groups share expenses, and (4) that Berea Lodge present the Junior Warden a Code at Installation time. The next month it was decided that the Lodge have 1,000 copies of the By­Laws printed and mailed to all the members. At the meeting of December 12, 1958 the retiring Master presented a lapel pin to the Installed Master with the admonition that the pin be passed on to succeeding Masters of the Lodge. The November, 1958 issue of the "Compass" told of a "Memory Album" being presented to the Lodge on October 24, the album consisting of the pictures of 98 of the brothers of Berea Lodge who had had their photographs taken earlier by the Allen Studios of Detroit. The album also contains a montage of the officers and is a worthwhile addition to the archives of the Lodge. 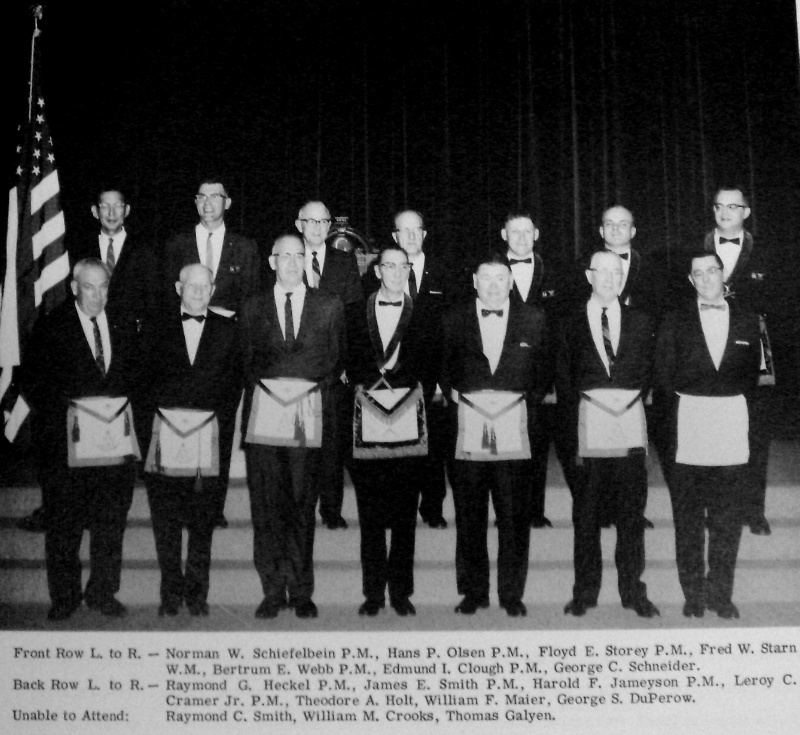 Another donation was received in Berea Lodge when a brother presented a cabinet for Past Masters' Aprons on April 10, 1959, and a year later Wor. Bro. Storey (President of the Temple Com­pany) was presented with a 50-star flag for use by the adult bodies meeting in the Lodge room. 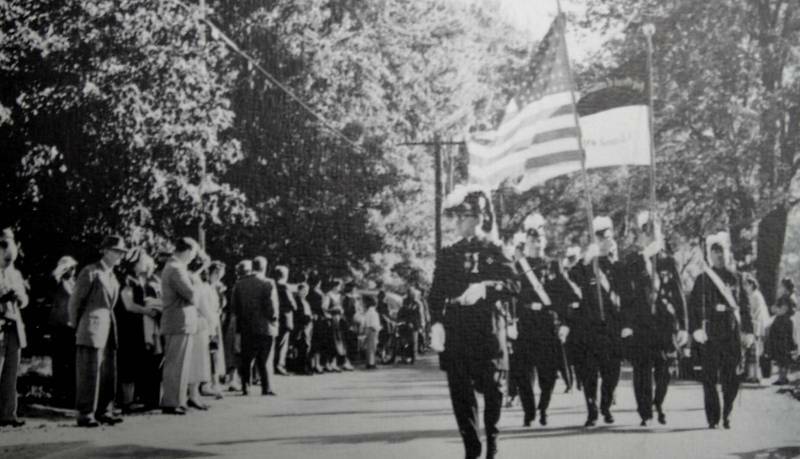 Eighteen brethren who were veterans of World War I, World War II, and the Korean conflict served as honor guard while the colors were being posted. Meanwhile, continued inflation brought still another increase in the dues. 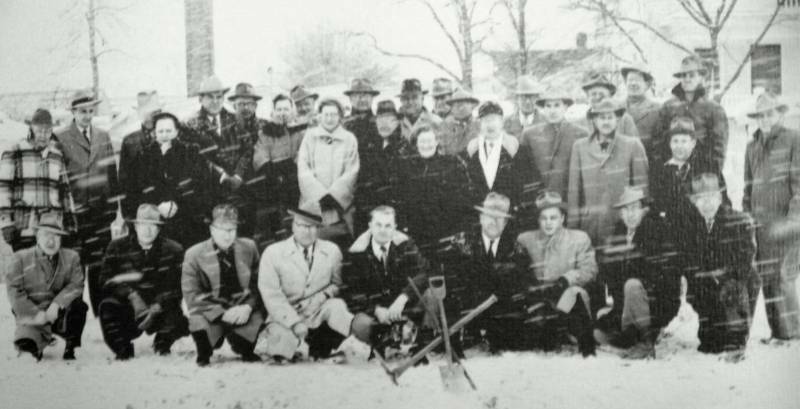 As of the first meeting in November, 1959 the mem­bers of Berea Lodge were to pay $15.00 in annual dues. Wor. Bro. Robert M. Kraft was recognized for his time and untiring effort by being given a lifetime appointment to the Temple Board on May 22, 1959. Embarking on the 1960's the Lodge was the recipient of still further donations, the Hiram Club presenting a 16 mm. Bell and Howell movie projector, and a brother a taper lighter. In addition, chair trucks, sand jars and ash trays were received. During the year Wor. Bro. Wesley Buehl was Master the Lodge saw fit to raise the fees for the conferring of the degrees to $130.00, this measure being passed on March 24, 1961. In May the Officers' Aprons now being worn were purchased, and these were presented to Berea Lodge via Bro. Norman Schiefelbein to Wor. Bro. Buehl in Novem­ber. By the Fall of 1962 still another generous donation was made to the Lodge, this time in the form of a public address system in­stalled in the Lodge Room. A thoughtful brother provided this facility. Another Honorary Membership was conferred in 1963. A spe­cial meeting held on June 29, 1963 bestowed this honor on Right Worshipful Brother Colin B. Montis, in recognition of his zealous and distinguished Masonic services. In the Spring of 1964, a brother presented the Lodge with a handsome desk which he had built and finished. This fine piece of furniture is now in use in our Lodge anteroom. "Our first stated meeting of the New Year was held on January 8th, and I am happy to report that during this meeting we were informed that the indebtedness on Berea Temple is now a thing of the past. The Temple Company has now met all the present financial obligations. Wor. Bro. Robert M. Kraft, who recently retired as president of the Temple Board, was the bearer of this good report. As a result the members of Berea Lodge voted to con­tribute $1000 to an endowment fund set up by the Temple Company for future maintenance. 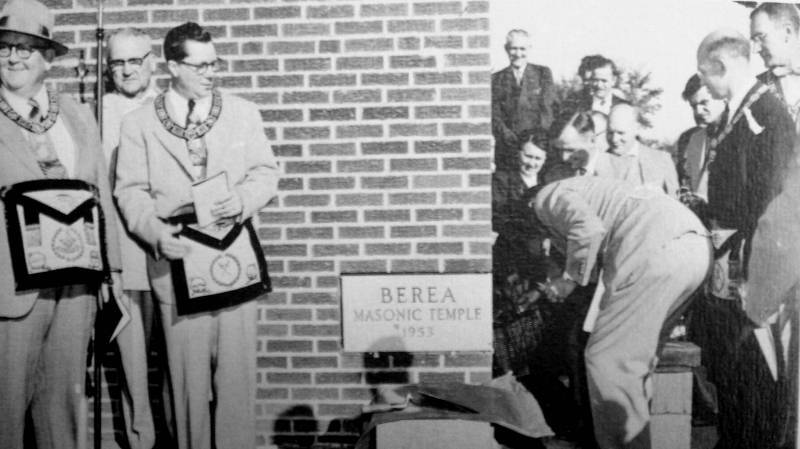 An initial contribu­tion was made by one of the brethren and others will follow . . . . "
The rapidity with which the new Berea Temple was paid for is indeed a tribute to the spirit and initiative of the members of Berea Lodge, Berea Chapter, and the White Rose Chapter of the Eastern Star! Without the tremendous expenditure of effort and the fine cooperation of the brethren who unselfishly gave of their time, strength and skill in constructing the new Temple, and the gener­osity of others in donating both money and furnishings, Berea Lodge would not be the handsome edifice it is today. Most certainly this structure represents the finest of Masonic virtues. The year 1966 saw much effort expended toward maintenance of the Temple, both inside and out, in order to keep the building and property in good condition as well as attractive. Brothers do­nated much time on various painting projects, and during the Sum­mer months the kitchen ceiling and walls were given a fresh coat of paint as were the dining room, the stage, and the stairwells. The Annual Christmas Party held on December 17, 1966 had 300 in attendance, the largest turnout yet for this happy affair. As the Centennial Year for Berea Lodge began, a brother do­nated new electric lanterns for use by the Fellowcraft Team, and the Annual Steak Dinner of March 18 resulted in 476 delicious din­ners being served, another "full house." Additional maintenance and improvements have continued dur­ing this year, with repairs on the roof being made by the Temple Company and the paving of the parking lot under way. And of course the past year has included various committees working and plan­ning for the Centennial Observance. "Presented to Berea Lodge No. 382 F. & A. M. by S. S. Brown, ag't of American Bible Society Dec. 10, 1867"
Now serving in its one hundredth year, Berea Lodge has re­ceived its 1000th petition, and is looking forward to perpetuating its work in the next century of operation. As a Century of Masonry in Berea Lodge draws to a close and we look back through the records in the archives one cannot be anything but impressed by the foresight and dedication of our brethren of one hundred years ago. It must have been a joyous occasion when on Octo­ber 16, 1867, a charter was issued to Berea Lodge #382 by the Grand Lodge F. & A. M. of Ohio. Since that time, by the practice of Masonic ideals and principles, Masonry has flourished in Berea Lodge. Through the years there were no doubt many pro­blems, just as there are today, but by Time, Pa­tience and Perseverance these problems were re­solved, and by so doing, the links in the chain of Masonic teachings became stronger until the ties of Brotherly Love, Relief and Truth are what they are today. To be a small part of such a long line of faith­ful servants of Berea Lodge is an honor that is regarded very highly. As we embark on another century we ask the Great Architect to give guidance and humility to the generations ahead, that they might maintain the legacy we have inherited. Mr. Fred W. Starn, W.M. I would like to extend to you and the brethren of Berea Lodge No. 382 my most sincere congratulations, together with those of the Grand Lodge of Ohio in the observance of your 100th anniversary. Lodge has continued steadfast in well doing". The many contributions, both fraternal and cultural, made by your Lodge is well known. It has been like a light set upon a hill in your Community. However, the history of the past should be but a foundation for the future. Berea Lodge has done well during its first century, but may we expect greater accomplishments from it in the future? We trust that the next century may be even more successful and rewarding than the one just past. Once again, I offer my congratulations and best wishes.